Worst Best Picture: Is Rocky Better or Worse Than Crash? In “Worst Best Picture” we search every single Best Picture Oscar winner of all time from 1927 to present to uncover the worst of them all. Conventional wisdom says that 2005’s winner Crash is the worst winner in history. We won’t stop until we’ve tested every last one. Read the the first, our review of Crash, here. Posts will be relatively spoiler free, but there may be some details revealed. Today’s installment is the 1976 winner Rocky. Is it better than Crash? Network and Taxi Driver both came out in 1976, the same year Sylvester Stallone cemented his place in pop culture with Rocky. 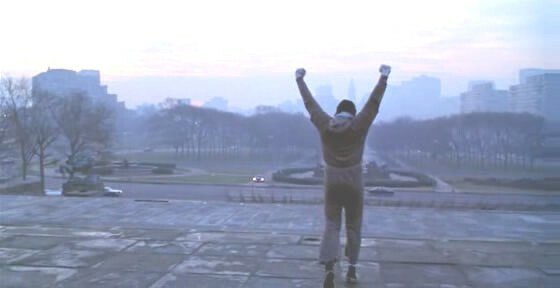 There is absolutely no question that the endurance of Rocky as an underdog story and the permanent representation of boxing is deserved. It’s Rocky. You don’t need me to tell you what Rocky is. It’s strange, though, to consider it as a “film great” against Network and Taxi Driver. They’re both better movies, but not to the degree that this is some kind of historical slight. I’ve never heard anyone call 1976 a travesty in the way people talk about Saving Private Ryan losing to Shakespeare in Love or The English Patient beating Fargo. The official Oscars website has a big picture of Frances McDormand on their page for 1997 despite the loss, but 1976 belongs to Sly and Rocky. There are many movies on this list that I’ve never seen, but there’s only a few that seem strange to me to have missed. Until a few days ago, I had never actually watched all of Rocky. It’s a weird thing to do for the first time. I’ve seen so many parodies and homages and references to it, but I’d never seen the source material. The overwhelming thing about Rocky is that you just about can’t understand a damn word Sly Stallone says. Rocky the character is supposed to be a sleepy, kinda-dumb-kinda-not every-man, of course, but it’s weird to have heard so many impressions and then hear how much weirder the voice actually is. Sly’s the same weird guy in every movie, but as Rocky he’s full-on marblemouth. You probably already know that, but it’s no less weird to finally hear it happen. He’s a boxer who never got a shot and then he gets one. He fights the heavyweight champ. He gets the girl, though he’s always had the girl. It doesn’t need to be more than it is. It’s Rocky, the feel-good punching story of our lives. It’s not the chilling tale of Taxi Driver and it’s not the risky parable of Network, but it’s fine. Rocky shouldn’t be what we have as the history of 1976, but it’s no huge insult to its betters, either. The Best Part: The climactic fight is great, of course, but it’s the bit you already know: the training montage with the art museum steps and the glass of eggs and the train tracks and the song. The movie wanders around Rocky’s love life for a long time and they spend too much time establishing that you should feel bad for this lug, but the montage is iconic for a reason. It’s hard not to get excited, even though you know what’s coming. The Worst Part: I spent a lot of time thinking about Talia Shire, the woman who plays Rocky’s love interest Adrian. She’s trapped in a weird place in Rocky. Rocky genuinely loves her and her life’s a mess, so it’s probably for the best that she falls for him, but she still doesn’t really get a lot to do. No one other than Rocky himself really gets much to do, honestly. There’s nothing really below the surface for anyone else, and some of the “emotional” outbursts from other people feel strange because they’re mostly ciphers. Is It Better or Worse than Crash? I’ve mostly used this space to assault Crash as a dumb, hateful view of race in America. It’s definitely that, but it’s also the story of unlikable people becoming likeable and vice versa. Crash wants to play with your emotions; the good guys aren’t always good and the bad guys are usually complicated. Crash gets a lot of hate because it’s ham-fisted, but it’s trying to do something complicated. Rocky isn’t trying to do anything complicated at all. If these were both made with the same amount of care, Crash would be the far better story. They’re not, though, and Sly Stallone’s love-song to underdogs is more compelling.